View video of the Feb. 26 public symposium. 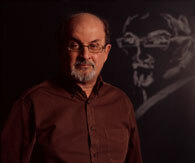 Emory University Distinguished Writer in Residence Salman Rushdie will join journalist and author Christopher Hitchens and filmmaker Deepa Mehta for a public symposium titled "The Only Subject is Love: Imagining Better Worlds," from 1-3:30 p.m. Friday, Feb. 26 at Emory's Schwartz Center for Performing Arts, 1700 N. Decatur Rd. Rushdie, Hitchens and Mehta will be in conversation with Emory professors Deepika Bahri, Laurie Patton and Matthew Bernstein on how the imagination helps to address the global challenges of our times. The symposium will include time for audience questions. The symposium celebrates the opening of Rushdie's archive at Emory's Robert W. Woodruff Library. A multi-media exhibition, "A World Mapped by Stories: The Salman Rushdie Archive," will be on display in the Library's Schatten Gallery from Feb. 26-Sept. 26. In addition to placing his archive at Emory in 2007, Rushdie began that year a five-year appointment as Distinguished Writer in Residence in Emory's English department. During each of the five years he is in residence for at least four weeks, leads an English seminar, participates in undergraduate classes, advises students, engages in symposia and delivers a public lecture.